Virtually all American jurisdictions have laws—either rules of evidence or mediation-privilege statutes or both—that exclude from evidence statements that parties make during negotiations and mediations. The legislatures (and sometimes courts) that have adopted these exclusionary rules have invoked a public policy rationale: that parties must be able to speak freely to settle disputes, and they will not speak freely if their statements during negotiation can later be admitted against them. 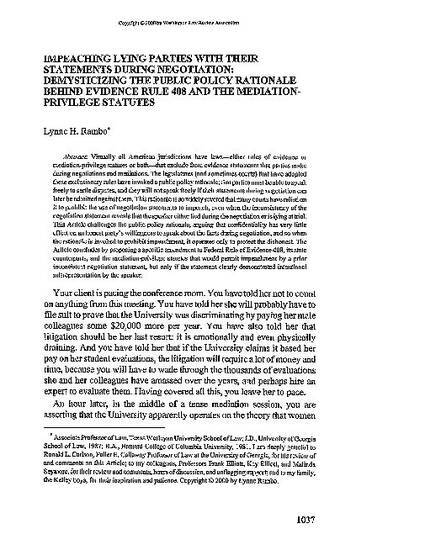 This rationale is so widely revered that many courts have relied on it to prohibit the use of negotiation statements to impeach, even when the inconsistency of the negotiation statement reveals that the speaker either lied during the negotiation or is lying at trial. This Article challenges the public policy rationale, arguing that confidentiality has very little effect on an honest party's willingness to speak about the facts during negotiation, and so when the rationale is invoked to prohibit impeachment, it operates only to protect the dishonest. The Article concludes by proposing a specific amendment to Federal Rule of Evidence 408, its state counterparts, and the mediation-privilege statutes that would permit impeachment by a prior inconsistent negotiation statement, but only if the statement clearly demonstrated intentional misrepresentation by the speaker.